Most of the online coffee retailers run retro style websites. They have good reason for that as such web designs touch users feelings, warm them up and make them feel at home. However, the new generation of online shoppers prefer modern trendy layouts that look good either on their desktop computer or smartphone. If you want to cater to the needs of the wider audience choose this design. It has absolutely everything for successful eCommerce welcoming, user friendly web pages, quality images, soft colors, circles, so fashionable nowadays, excellent product presentation, simple check out and many other features. Using sample data installer, it will be possible to install a web template using sample data, therefore get web page that seems similar to the live demo. Inserting sample data to your WordPress theme is a convenient way so that you can test the theme and check out how the content will appear to be as soon as it's done. Bootstrap scales any of your websites from smartphones to desktop computers using the same codebase. It makes the web developing process faster and easier. Search engine friendly layouts are improved as per the present day SEO requirements. This increases the possibilities they're going to be seen online, thus increasing your home page's search engine ranking positions in search engine results. Search Engine Friendly layouts help to increase your webpage place in search engine final results. On-line chat is a feature that involves real-time messaging over the web. On-line chat will probably be the easiest process to build bonds with any visitors and turn them into your customers. Responsive design renders a web site page same exact properly on any existing display size. No matter what kind of gadget your users are going to utilize to enter the homepage - they might see a vibrant graphic which has a handy navigation menu. It becomes an especially valuable function, taking into account that nearly all internet users currently favor their mobile phone devices for internet surfing. Can I resell the customized Restaurant PrestaShop theme? No, you cannot resell the customized Restaurant PrestaShop theme as a template but you may sell it as a project to your client (see paragraph 1 ONE TIME USAGE LICENSE for more details). What is the difference between unique and non-unique PrestaShop template for Coffee Store purchase? Non-unique purchase:Non-exclusive purchase means that other people can buy the PrestaShop template for Coffee Store you have chosen some time later. Unique purchase:Exclusive purchase guarantees that you are the last person to buy this template. After an exclusive purchase occurs the template is being permanently removed from the sales directory and will never be available to other customers again. Only you and people who bought the template before you will own it. Is it possible to use your PrestaShop designs for National Cafe to develop websites for my customers? Yes. It is perfect for designers who want to offer their customers a high-quality design and also save time and money. Keep in mind that when you purchase the PrestaShop theme for Cafeteria with ordinary or exclusive license you're entitled to create only one project (one domain name). Is it possible that Template Monster will contact my client which website I made from Template Monster's website Coffee Store PrestaShop ecommerce theme? Yes, our legal department checks licenses regularly. In case we won't find designer's contact information on the site which was made from the Coffee Store PrestaShop ecommerce theme of ours we will contact the owner of the site directly. Can I get the PrestaShop design for Food & Restaurant Services in higher resolution to use for printing? No, we design PrestaShop designs for Bistro optimized for web resolution only. What is Extended License for Food & Restaurant Rewies PrestaShop design? I would like to purchase PrestaShop design theme for Cafe Franchise, but it is not available on the site anymore. The PrestaShop design theme for Cafe Franchise has been sold out for exclusive price or discontinued.As technology inevitably develops, TemplateMonster may discontinue the production of certain products. It can be no longer available for sale because of being outdated. How can I modify PrestaShop ecommerce theme for Food & Restaurant Rewies to suit my particular website? Please visit our Online Help Center to obtain detailed instructions on editing PrestaShop ecommerce theme for Food & Restaurant Rewies. I ordered a PrestaShop ecommerce theme for Food & Restaurant Magazine but haven't received the download information. In case of not receiving the download information of a PrestaShop ecommerce theme for Food & Restaurant Magazine, please contact our Billing Department via support chat by phone or e-mail. Are your Coffee Shop PrestaShop ecommerce themescompatible with any CMS? Do you provide any scripts with your PrestaShop themes for Food & Restaurant Rewies or could you do some custom programming? Our templates do not include any additional scripts. Newsletter subscriptions, search fields, forums, image galleries (in HTML versions of Flash products) are inactive. Basic scripts can be easily added to a Bistro PrestaShop design theme at www.TemplateTuning.com If you are not sure that the element you're interested in is active please contact our Support Chat for clarification. What is a unique purchase license for PrestaShop template for Food & Restaurant Articles? If you purchase the product at a 'Unique price' it guarantees that you are the first and the last person to buy this PrestaShop template for Food & Restaurant Articles from us. It means that this template has not been sold before and you become an owner of a unique design. After this kind of purchase the template is being permanently removed from our sales directory and is never available to other customers again. The unique purchase license allows you to develop the unlimited number of projects based on this template, but the template should be customized differently for every project. What will I see instead of the images after installation of the PrestaShop design for Food & Restaurant Services? After PrestaShop design for Food & Restaurant Services installation you will see blurred images included for demo purposes only. Will the PrestaShop ecommerce theme for Food & Restaurant Magazine be deleted from TemplateMonster database? No, the PrestaShop ecommerce theme for Food & Restaurant Magazine will not be deleted from TemplateMonster database. In what cases I don't need the extended license for PrestaShop design themes for Cafeteria? Can I contact the Food & Restaurant Magazine PrestaShop template author? Yes. You can contact this Food & Restaurant Magazine PrestaShop template author/author's team directly using your personal account under the Support tab. What is a buyout purchase license for PrestaShop design for Coffee Shop? If you purchase the product at a 'Buyout price' it guarantees that you are the last person to buy this template from us. 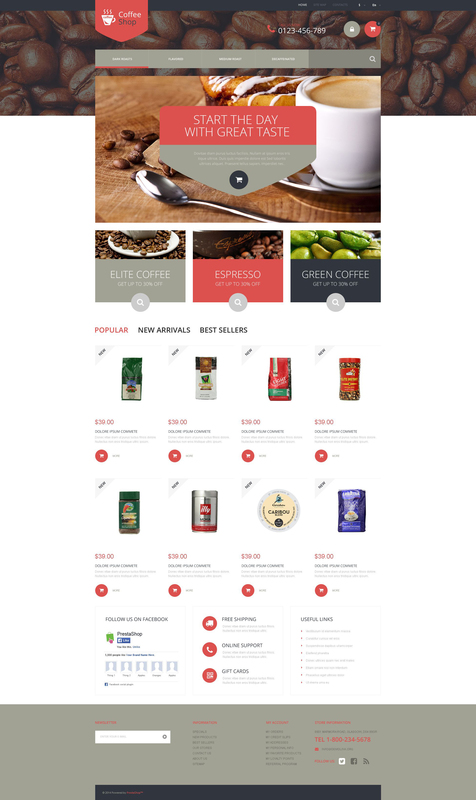 It means that this PrestaShop design for Coffee Shop may have been sold before a couple of times (see 'Downloads' number in item's properties) but only you and people who bought the template before you will own it. After this kind of purchase the template is being permanently removed from our sales directory and is never available to other customers again. The buyout purchase license allows you to develop the unlimited number of projects based on this template, but the template should be customized differently for every project. Are there any limitations on selling the PrestaShop theme for Coffee Shop Restaurant as the integral part of my new product? What do I receive when I order a PrestaShop ecommerce template for Cafe Chain from TemplateMonster.com? After you complete the payment via our secure form you will receive the instructions for downloading the PrestaShop ecommerce template for Cafe Chain. The source files in the download package can vary based on the type of the product you have purchased.If you need unzipping software to open the .zip archive, Windows users may visit www.WinZip.com, Mac users may visit www.StuffIt.com. Can I apply a discount code to a discounted PrestaShop design for Coffee Shop or combine several discount codes together to get better price? Is it reasonable to make unique purchase of PrestaShop ecommerce template for Restaurant that was already purchased before? Yes, it's reasonable to make a unique purchase of PrestaShop ecommerce template for Restaurant. Because there is very small chance that you will find the same design on the net. There are more than 3,000,000,000 webpages online now according to statistics on www.google.com.